Hi, y'all! Andi from Estella's Revenge here! Jennifer was kind enough to allow me to guest post while she's away, and I couldn't be more excited about it. March is an exciting time for me because I'm getting married on March 15th! You heard me. It's RIGHT around the corner. Part of the many fun parts of getting married is getting all dreamy-eyed about the house we will most likely purchase one day when we've put our super earning powers together and paid off our student loans. I know we can! I know we can! One thing we've already discussed about our one-day-we'll-have-it home is a library for me. Being a huge Pinterest nerd, I'm also really into the idea of a reading nook. The catch: I'm not handy at all. Kid nooks I can handle. Nailing a shelf? Yes sirree! This pretty much covers my level of expertise. But a built-in? That just looks scary. This small built-in nook framed out window-seat style looks a little less intimidating than some others I've seen. Comfy, cozy, placed in an obvious, existing location, natch! And I betcha my fiance and his collection of saws could nail this. Here's where things get WAY out of my league. We would most likely have to hire a handyman to frame this bad boy out and build in the shelves at all those weird angles. But at least I have this Pinterest inspiration to show someone while I'm writing them a check. If you could brainstorm a perfect reading nook, what would it look like? Feel free to share some Pins of your own! 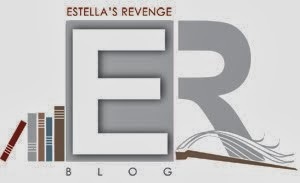 Thanks a million to Andi from Estella's Revenge for guest posting here today! My problem with most of the nooks on Pinterest is the lack of back support. You can't sit for long periods of time on those low backed bench nooks. I need a small room really with a comfy chair. Years ago when we moved into our current house. I made the mistake of given the kids the loft. I am going to take it back soon. Ti, that's why I like the one that more or less looks like a built in bed. I can read on my stomach in bed all day. Though, that might defeat the purpose of a nook. That is GORGEOUS, Natasha! Totally droolworthy, and so bright in the white. Love it. These all look really cool! I love the wall of bookshelves the best and that secret storage space... ;) I personally love comfy seats so I don't think the seating in that nook will work for me, though. THose are some pretty amazing book nooks. My favorite is the one in periwinkle with all of the angles to it. If I had funds on my hand, I'd build those in a couple of rooms in my house. LOVE! I thought they were pretty swanky. Now to buy a house to put one in! I love all of these...especially the windowseat nook. If only I could fit one of those in my house. 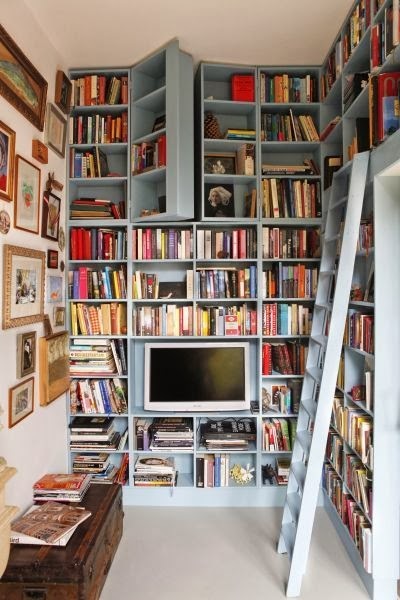 But the hidden bookcase with secret shelves? That's awesome. Thanks so much for posting these!! Thanks for stopping by and commenting, Lark! Those hidden bits are heavenly. Big chair with some place to put my feet up, lots of light, and little table next to it. Trying to figure out how to work this into my guest room. After all, I don't have guests that often - somebody needs to use that space! Amen sister! Guest rooms should really be fun rooms that guests stay in sometimes. I love book nook dreaming! These are great. Thanks, Jennine! I thought these were pretty darn awesome for bibliophile daydreaming. I got a recliner in my bedroom, put a book case next to it, and ta da! I have a sweet little book nook. There's all kinds of easy way to get your books within arm's reach. Dream away! I believe those dreams will come true. 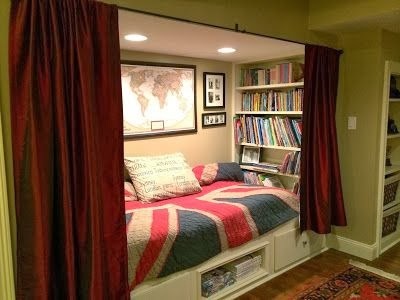 OMG I want a book nook!!! Does having a checkbook make me handy, too???? Hahahah! One day. One day. I have the perfect book nook. Of course I had to wait until my sons were (1) grown and (2) moved out (two different things) to obtain his tiny slice of heaven. I simply took over one of my sons room. It is perfect. Day bed. Tiny desk. Relaxation fountain. Music. Appropriate reading (Don't Let the Pigeon Drive the Bus) posters. Perfect. Hi Andi and Jennifer! 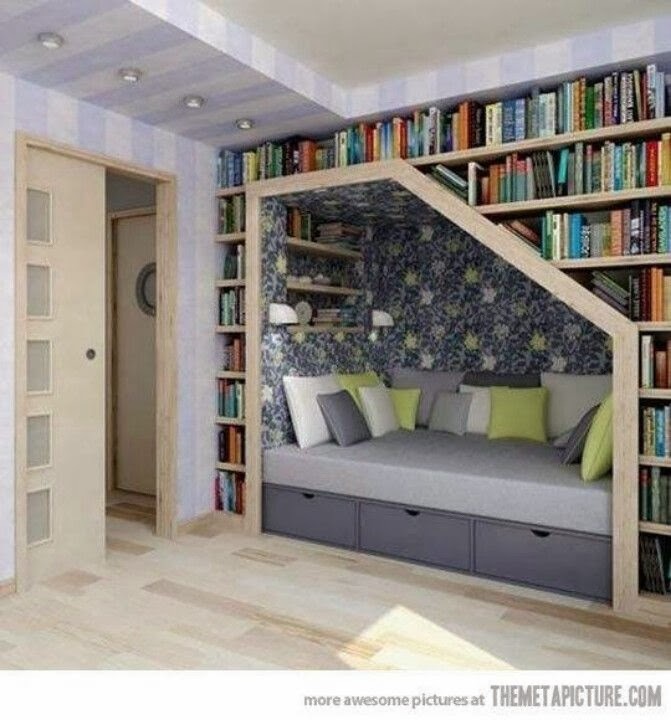 Those are some awesome reading nooks! 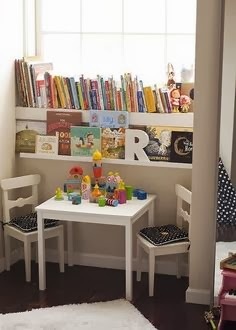 Oww I love pictures of book nooks. My plans for my new library room are with a handyman right now and we still need to solve some issues about how many shelves (ALL THE SHELVES OBVIOUSLY) and the height of them before he will set on a prize but will end up wit my own library room in the guest room and so going to love it! !